I am feeling a bit restless today and have trouble sitting still. So I looked into my cupboard to see if I can whip something yummy up. I see I still have a bag of chocolate chips and cranberries from Christmas, so why not bake some chocolate chip cookies? My friend gave me this recipe several years ago, and it is perfect because I have all the ingredients listed! 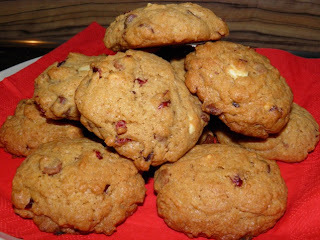 And the cookies are nice and chewy - perfect for a mellow Friday evening. 1. Heat the oven to 175 degree C. Grease a baking sheet. 2. In a large mixing bowl, cream the butter, brown sugar and granulated sugar. Add the egg and vanilla, and beat until the mixture if smooth and creamy. Gradually add the flour, baking soda, and salt into the bowl and beat until blended. Stir in the chocolate chips and cranberries. 3. Drop the dough by very rounded tablespoonfuls onto the greased baking sheet, spacing the mounds about 2 inches apart. Bake the cookies for about 15 minutes, or until nicely browned. 4. Remove the baking sheet from the oven and let it cool for about 3 minutes. Then transfer the cookies to a rack and let them cool completely. Makes about 18 cookies.